Here's a navy blue short wedding guest dress from the designers at Emerald Sundae that allows you to attend the nuptials in classy style. Also beautiful as a cocktail dress, this slinky v-neck party dress features a ruffled flounce that drapes seductively over the arms to create a trendy cold-shoulder detail. In soft jersey, the knee-length pencil skirt is topped by a high waistline that visually slims and elongates before skimming the hips. 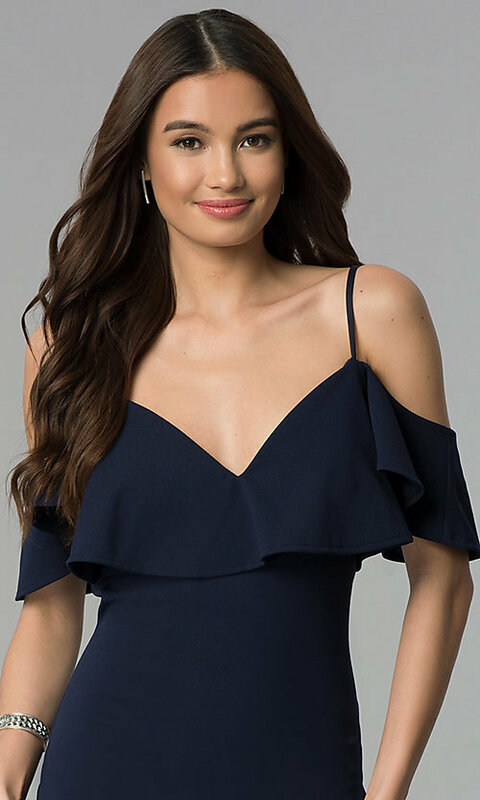 Adding stability, thin straps complete the look of this enchanting navy blue wedding guest dress, under $50, that combines shape-enhancing details with a budget-friendly price tag.